Lenny Holtzman, hairstylist to the Kennedys, worked on Paige Leavitt’s hair while assistant Genevieve Bothwell waited to color it. MARSTONS MILLS — Framed and faded magazine clips hang at the entrance of Lenny Holtzman’s salon here, a tribute to his role in Massachusetts history styling both Caroline Kennedy’s and Maria Shriver’s hair on their wedding days. But Holtzman, the self-described “hairstylist to the Kennedys,” said the beauty school industry has a problem. Too many young hairstylists applying at his salon have too few skills and are not qualified for a job — despite spending thousands of dollars at beauty schools. Holtzman’s situation illustrates a broader problem in the career training industry, one dominated by for-profit schools. Although students pay steep tuitions to attend programs in cosmetology, cooking, or computer repair, some schools mislead students with promises that they will graduate with sought-after skills and well-paying jobs. 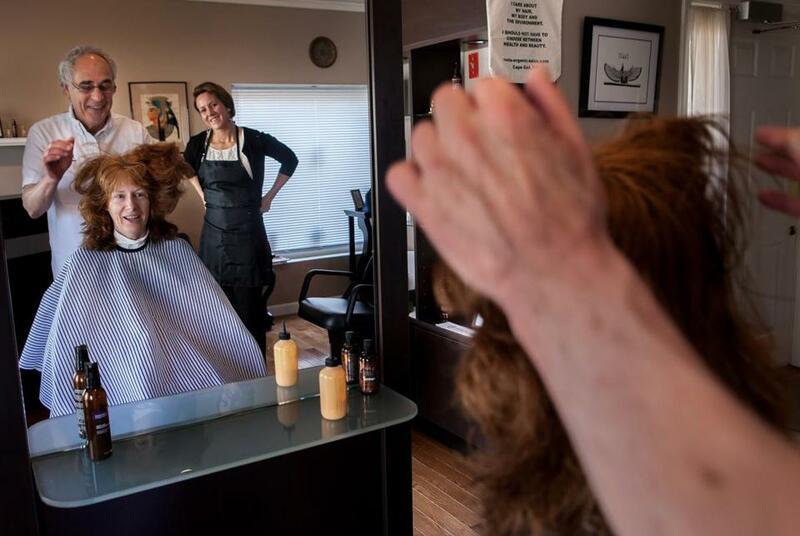 Holtzman, 70, said many beauty school graduates borrow more than $10,000 to pay for less than a year of beauty school, enabling them to pass the state’s certification test, but nearly all of them need years of additional training to work as a stylist at Roots, his Cape Cod salon. If the situation puts some employers in a bind, it is even worse for students who attend a variety of for-profit schools thinking they will improve their lives, but end up burdened with debt, and in the worst cases, defaulting on their loans. For-profit schools had higher dropout and student loan default rates than nonprofit colleges and universities, according to a report issued last year by the US Senate Committee on Health, Education, Labor, and Pensions. Programs offered by for-profit schools can cost at least four times as much as comparable programs at community colleges, according to the report. In many cases, the Senate report found, for-profits spend more on marketing and recruiting than on instruction and career counseling. The average chief executive’s salary at a for-profit training and education company was $7.3 million in 2009, seven times the average salary of presidents at large public universities. Thirty-two states, including Massachusetts, have joined a group led by Kentucky Attorney General Jack Conway investigating the industry. Massachusetts Attorney General Martha Coakley is examining a dozen schools, including Apollo Group, the parent corporation of the University of Phoenix, and the Everest Institute campuses in Brighton and Chelsea, owned by Corinthian Colleges Inc. Spokesmen for Apollo and Corinthian said they had been asked by Coakley’s office to provide information and were complying with those requests. Coakley’s office brought a lawsuit against Brockton-based Sullivan & Cogliano Training Centers Inc. last month, alleging its promises to train students for well-paying careers as medical assistants were misleading and the school’s graduate employment rate included graduates working at fast-food chains. Sullivan & Cogliano declined to comment. Iyoki Ortiz, a single mother in Dorchester, is still trying to find a job since graduating from the medical assistant program at American Career Institute in Cambridge more than a year ago. A supermarket cashier, she took the 13-month course after seeing a television advertisement promising the training would lead to a good-paying job and better life. She borrowed $13,000 at a 6.9 percent interest rate to pay for the program, but remains unemployed. American Career Institute ceased operations and closed its campuses in Braintree, Cambridge, Framingham, Springfield, and Woburn in January, according to the state Office of Consumer Affairs. Company officials could not be reached. “Fifty percent of recent grads from law school do not have jobs as lawyers,” Gunderson said. Angela Watson, a spokeswoman for Empire Education Group, which describes itself as the nation’s leading provider of cosmetology education and operates five Empire Beauty Schools in Massachusetts, said the Pennsylvania-based company has helped thousands of hairstylists pass state licensing exams and get placed in jobs. In the cosmetology industry, graduation from beauty school often does not automatically lead to a job as a stylist. Several Massachusetts salon owners said they often hire beauty school graduates certified as stylists in lower-paying jobs as assistants or shampooers because they need additional training. “They definitely need more work on their skills,” said Jamie Gizanis, director of education at Dellaria Salons, which operates 26 salons in New England. Holtzman, the Cape Cod hairstylist, is concerned about students who take out loans to enroll in programs that can cost $14,000 for less than year of training. He said they are often young, single mothers with little understanding of how the education system works and who end up burdened with debt, working for low pay or not at all. Half of all hairdressers in Massachusetts earned less than $12.86 an hour in 2010, according to the US Department of ­Labor. Holtzman, who on occasion styled Jacqueline Kennedy Onassis’s famed pageboy, said part of the problem is the system for licensing cosmetologists in Massachusetts. Unlike New Hampshire, where people can get training and certification through apprenticeships, Massachusetts requires aspiring hairstylists to attend a state-approved beauty school to get the certification they need to work. can be reached at ­mwoolhouse@globe.com.